Steve Young was a high school senior being recruited by Army when he stood on the sideline at West Point and watched a freshman for Pitt named Dan Marino. "I saw him throw an 18-yard out and thought, 'I'm never going to play in college,'" Young said. Of course, he did — and then the pros. 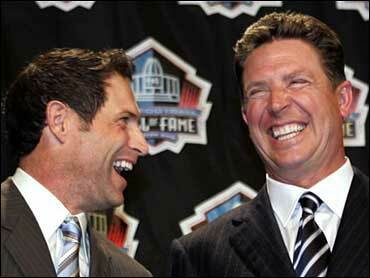 So did Marino, and on Saturday two of the NFL's best quarterbacks were elected to the Pro Football Hall of Fame. "It's an incredible honor," said Marino, the most prolific passer in league history. "It's humbling to think of growing up wanting to be a professional football player. "Mom and Dad, it's a long way from Parkview Avenue" he said, referring to where he grew up in Pittsburgh. And a long way from Greenwich, Conn., where Young was raised before heading west to Utah to play for Brigham Young. "I had a college coach, LaVell Edwards, who took a chance on a wild, crazy left-handed running quarterback from Connecticut," he said. That crazy kid is now the first modern-era lefty QB in the Hall. Yet another quarterback, Benny Friedman, and Fritz Pollard joined Marino and Young as the Class of 2005. They will be inducted on Aug. 7 in Canton, Ohio. "Let's overrun Canton with Dolphins fans," Marino said. "I invite you all to Canton and to have some fun." Each received at least 80 percent of the votes from the panel of 39 sports writers and broadcasters. Friedman and Pollard were nominated by the senior committee and chosen by the entire panel. Michael Irvin and Harry Carson, the other two finalists, did not get the required votes for induction. When Marino left the Dolphins after the 1999 season, he had NFL bests of 4,967 completions, 8,358 passes, 61,361 yards and 420 touchdowns. His record of 48 TD passes in a season was recently broken by Peyton Manning. Marino was that rare rookie quarterback who had an impact, even though he was the sixth QB chosen in the first round of the 1983 draft. Two others from that class, John Elway and Jim Kelly, already are in the Hall. Marino credited Hall of Famer Don Shula, the winningest coach in NFL history: "I remember coming in, he put a lot of pressure on me early." Then it was Marino applying the pressure to defenses. Although he never won a Super Bowl, Marino was the 1984 league MVP, made three All-Pro teams and nine Pro Bowls. When he retired, he owned 21 NFL marks, including most seasons with 3,000 yards or more passing (13); most yards passing in one season (5,084 in '84, the only year he won a conference championship); and most games with 300 yards or more passing (63). Young broke in with the USFL's Los Angeles Express, moved to the Tampa Bay Buccaneers, then won the 1995 Super Bowl with San Francisco. He was the league's most valuable player in 1992 and '94. "This is the place you're going to find out how good you're going to be. This is the spot. I embraced it," Young said, recalling his move from the USFL to the NFL. "I'm here because I did embrace it. It was a great ride." A clever runner with a strong arm and great field vision, Young made seven Pro Bowls and was a three-time All-Pro. He held the highest passer rating in league history (96.8) when he retired in '99. He also set the highest single-season rating of 112.8, which Manning also broke this season. In 1921, Pollard became the first black head coach in the NFL. He was a superb running back, leading the Akron Pros to the fledgling league's 1920 championship with an undefeated record. He later organized the Chicago Brown Bombers, an independent team of black players that barnstormed the country from 1927-33. He died in 1986. "He was a pillar of the league," said his grandson, Dr. Stephen Towns, "and we're gratified he's finally getting his reward for it." Friedman, who died in 1982, played for four teams from 1927-34 and was one of the early NFL's great quarterbacks. A contemporary of Red Grange, he also was a strong draw at the box office. Giants owner Tim Mara purchased the Detroit Wolverines, for whom Friedman played in 1928, not only to get him in New York's lineup but to fill the stands. "We both appreciate and honor the people who played in another era," Young said, speaking for Marino as well. "You're talking about having a passion for the game. We're here on the backs of so many other players."